One of the most popular deciduous flowering shrubs, and certainly one of the most nostalgic, lilacs herald the arrival of spring. When we reminisce about this old-fashioned favorite we recall large panicles of sweetly scented, pale purple blossoms. 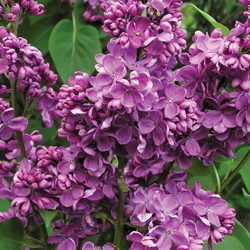 Today, however, lilacs are available in an incredible variety of sizes, growth habits, flowering times, bloom sizes, shapes, colors and fragrances. Lilacs belong to the genus Syringa that consists of approximately 20 different species and about 1,000 different varieties. Most species are native to Asia, but Syringa vulgaris, the common lilac, is an Eastern European native. Some of the finest cultivars of this species were bred in France in the early twentieth century, hence the term “French Hybrid.” Lilacs were cultivated in America’s first botanical gardens and grown by both George Washington and Thomas Jefferson. They remain a steadfast favorite to this day in public gardens as well as backyards, and many municipalities even host lilac festivals to celebrate these blooms each spring. 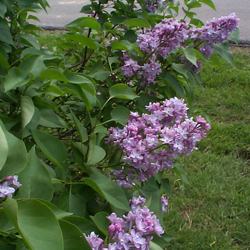 If cared for properly, a lilac bush has the potential to survive for hundreds of years. Planting your lilac in pH neutral, well-drained soil that is high in organic matter will help ensure the longevity of your shrub. Providing at least 6 hours of direct sun each day and deadheading immediately after flowering will guarantee an abundance of lovely scented blooms. Give lilacs adequate growing space so that they may grow to their full potential. Spacing these plants too closely will cause them to grow tall and spindly and only flower at the top; instead, be sure they have plenty of room to grow out as well as up and you’ll be rewarded with copious blooms all over the shrub. Fertilize with a high phosphorus fertilizer in the early spring to ensure the best growth and most luxuriant blooms. When your lilac reaches a height or shape that is no longer to your liking, you may remove up to 1/3 of the thickest stems. Cut them back to the ground. You may also shorten any unusually tall stems by cutting them back to a strong branch. Open up the crowded base of the shrub by removing a portion of the youngest stems. Remember; prune lilacs immediately after flowering before plants start to form next year’s flower buds. Syringa vulgaris provides the spring garden with perfumed blooms for up to two weeks. 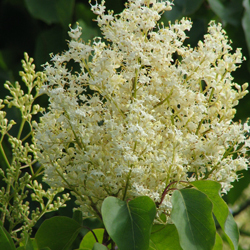 To extend the bloom season for up to 6 weeks, plant an assortment of the uncommon species along with the common lilac. Some excellent choices are hyacinthiflora (which blooms before vulgaris), paired with palibin, prestonia and reticulate (which bloom consecutively after vulgaris). 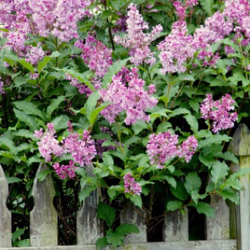 Want to branch out into even more lilac cultivation in your yard? See the chart below, or come in today to see the latest lilacs to love.